Marian Goodman Gallery is delighted to announce Anri Sala's exhibition "Purchase Not by Moonlight", which will open on Wednesday, May 6th and run until June 20th. 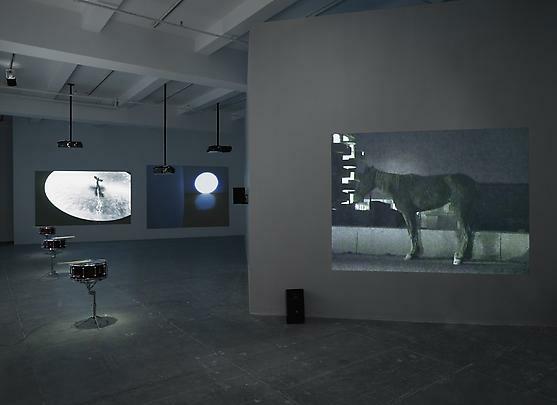 The exhibition will focus on "Purchase Not by Moonlight", 2008, a single work consisting of four distinct films, Answer Me, After Three Minutes, Time After Time, and Làk-kat, as well as a kinetic sculpture entitled Title Suspended and Doldrums, a series of snare drums. 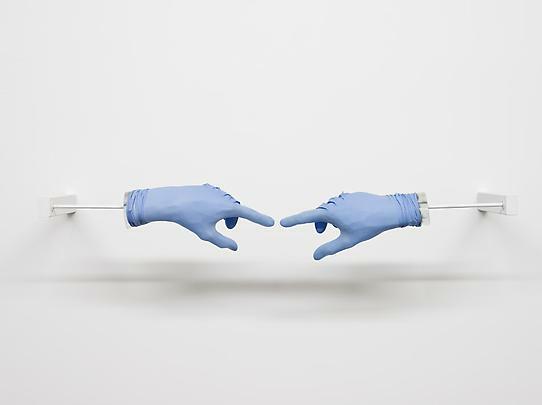 The work was first seen in Sala's recent solo show at MoCA North Miami, curated by Raphaela Platow, the second chapter of which will open at Contemporary Arts Center Cincinnati on May 30 and run through September 6. "The issue is how to translate the 'now' and 'then' to the 'here' and 'there' in the exhibiting space. In a traditional theater, the environment and the film are not put in conversation, neither are different films put in a relationship with one another. There is only one present - the present of the film – and the theater space is annulled. Whereas in an exhibition, as the visitor enters the space, there is a shifting between his/her present and the present of the film. For Purchase Not By Moonlight, I'm thinking of an exhibition where the present is choreographed. The films turn on and off, inducing a present that leads the audience through the exhibition space itself." Sala creates an environment in which the visitor's focus is directed toward specific works that engage in dialogue with each other, with the space, and the experience of the viewer. 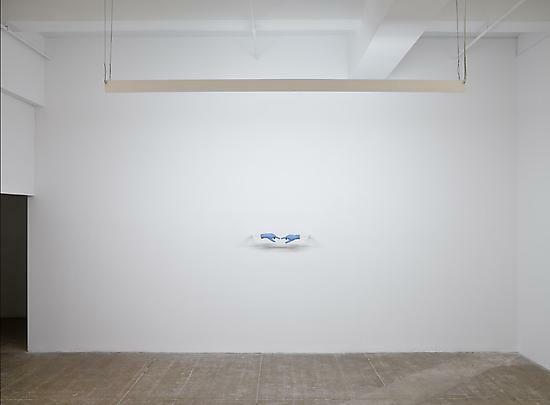 Many of the works presented explore the idea of echo. 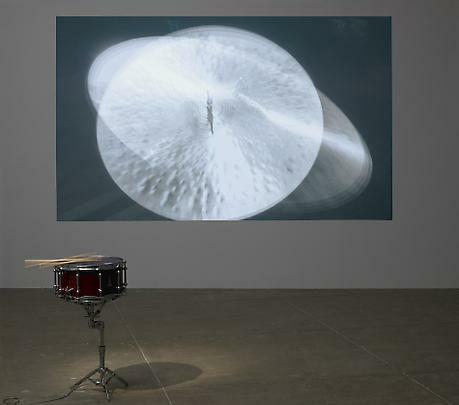 The boundary between the films and the viewer's spatial reality is rendered porous by Doldrums, 2008 free-standing drums that play, as if by magic, to the sound of a particular film. Sound is made visual, turning into an almost material echo of the cinematic space. Sala has long been interested in the slippage between sound, image and space. 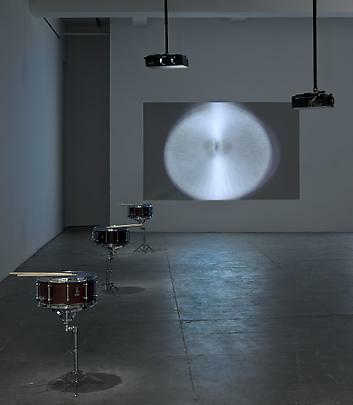 After Three Minutes, 2007 is a silent double video projection, consisting of a representation of Three Minutes, 2004, in which a cymbal was shot under strobe lighting at 90 flashes per second, becoming a dazzlingly visual rather than sonic object. Responding to the fact that video technology uses 25 frames per second and can't capture the totality of the strobe's 90 flashes, Sala re-shot the work when it was installed at The Irish Museum of Art, using a security camera at 2 stills per second. As Michael Fried observes in his recent essay on the work: "The particular brilliance of After Three Minutes. 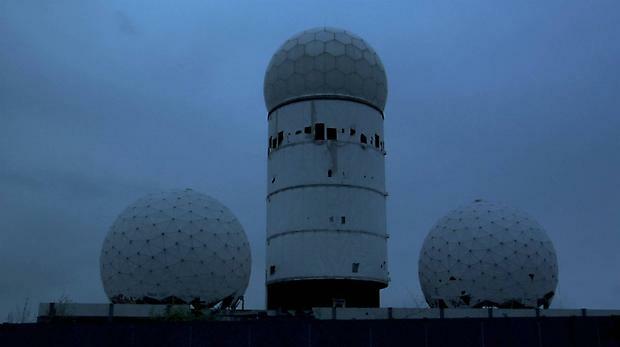 . . is that it thereby radicalizes the problematic of 'presentness'. . "
Sala's most recent work, Answer Me, 2008 was filmed in a Buckminster Fuller-created geodesic dome in Berlin, a former NSA surveillance tower, which was constructed on the Teufelsberg (Devil's Mountain), an artificial hill made of rubble from West Berlin under which a building by Albert Speer was buried. The interior of this abandoned dome is characterized by an extraordinarily long echo, which provoked Sala to stage a story there "whose drama would come under the influence of the building". The narrative is inspired by Michelangelo Antonioni, who wanted to shoot the silences in a couple's break-up. 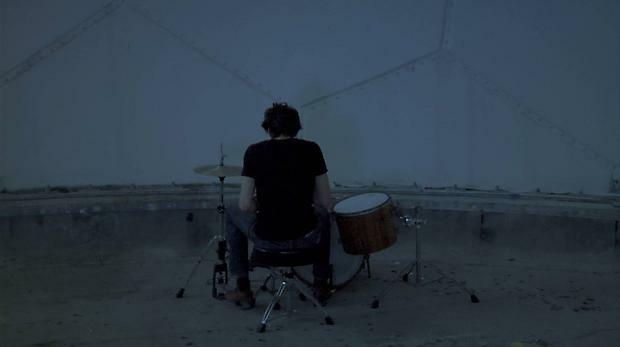 In Answer Me, the stillness becomes a loud stillness of silencing decibels: a woman tries to end a relationship, but her lover refuses to listen, playing fiercely on a drum set to silence her. Next to her, the drumsticks resting on a single drum play to the echo of his drumming. 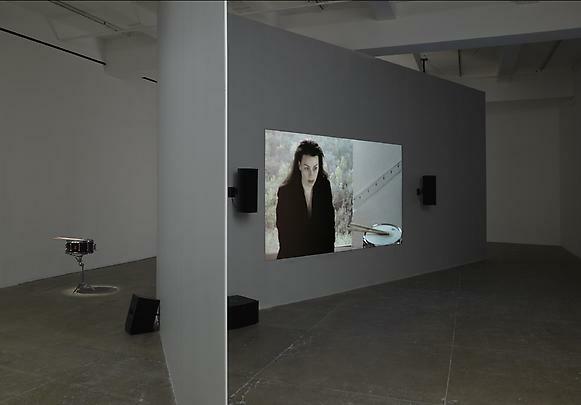 Another film that explores the idea of echo, although in a very different way is Làk-kat, 2004, which was shown in Sala's first exhibition at the gallery in 2004. 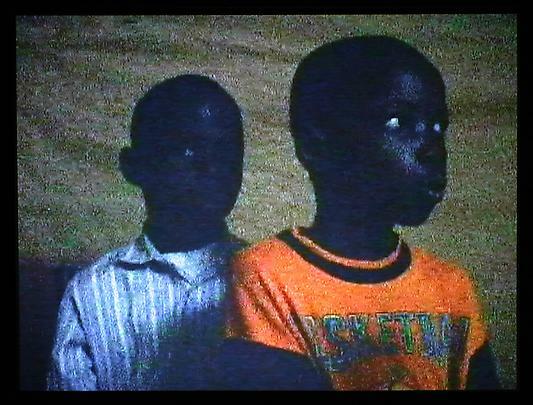 Filmed in Senegal in a darkened room, it shows three children pronouncing words in their native Wolof. 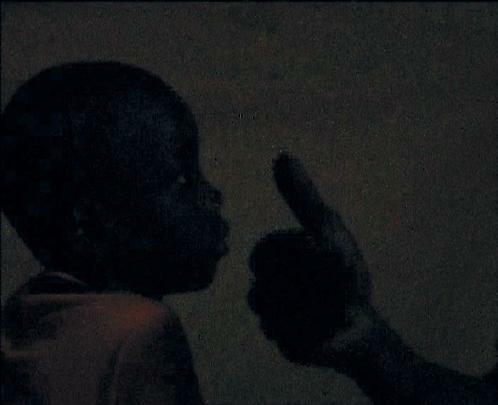 In an imperfect echo of their teacher's utterances they attempt to repeat words that Sala has chosen because they denote many nuances of black and white, of which the Wolof language has a particular wealth. (In contrast, the Wolof words for primary colors have been replaced by French words.) The words refer to skin color but also to light and dark and the film is interspersed with images of moths clinging to a fluorescent light. Làk-kat exists in different subtitles (i.e. American and British English), carrying different nuances and cultural associations of the country it is exhibited in. 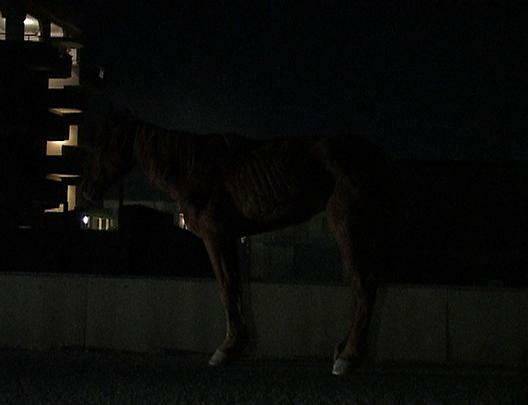 Time After Time (2003), the earliest work on view, shows the faint silhouette of a lone, emaciated horse standing on a highway in Tirana. It is illuminated, time after time, by the headlights of passing vehicles. As the cars pass, the focus slowly pulls out and the scene becomes a blur: the horse is only visible at the moment of its greatest stress. The artist once said that he likes to see "films as sculptures, in which the way you view the work is sequenced and time-coded". 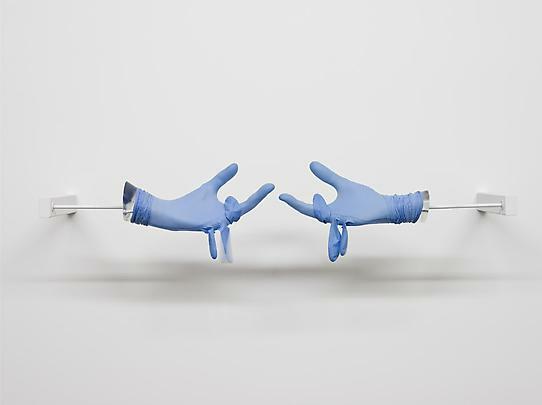 In Title Suspended, 2008 his first actual sculpture, the logic seems reversed, the two gloved hands (r)evolve in time – from entropy to bodily form - performing an almost cinematic loop. 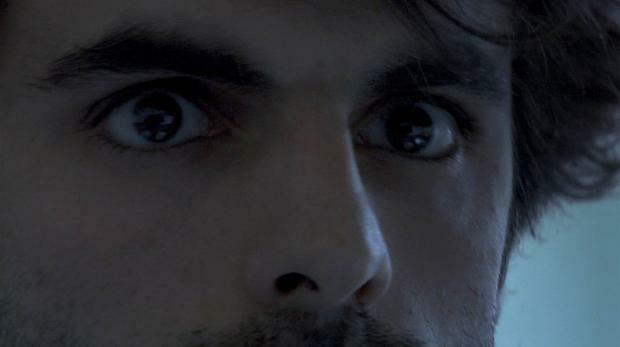 "Why the Lion Roars", 2008, Sala's project for Le 104 in Paris pushes the boundaries of the cinematic experience in yet another direction (http://whythelionroars.net). Sala has selected 57 films to which he has ascribed a particular degree of temperature, ranging from -11° to 45° Celsius. 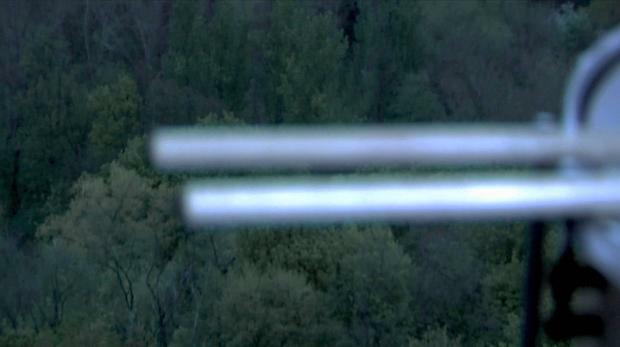 The films are programmed in response to the outside temperature, which is constantly measured by a thermometer, creating a composition of feature films through a feeling of temperature of the outside world. Some films are seen incomplete while others are projected whole and even loop at times. Every season plays different films, every day has its own program. The 4 prints in the exhibition are programs based on fictional future weather forecasts created from 16 years of meterological data. As Sala puts it: " 'Why The Lion Roars' is the temperature cut version of a fiction based on a true story: the weather." 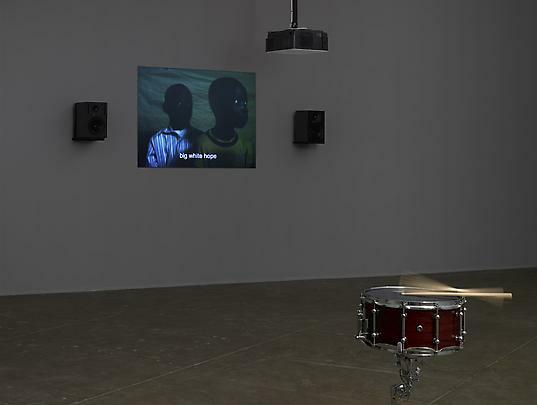 Recent solo exhibitions include Anri Sala, The Box, Wexner Center for the Arts, (2007), Long Sorrow at Depont Foundation Tilburg and Anri Sala at Fondazione Nicola Trussardi, Milan (2005). 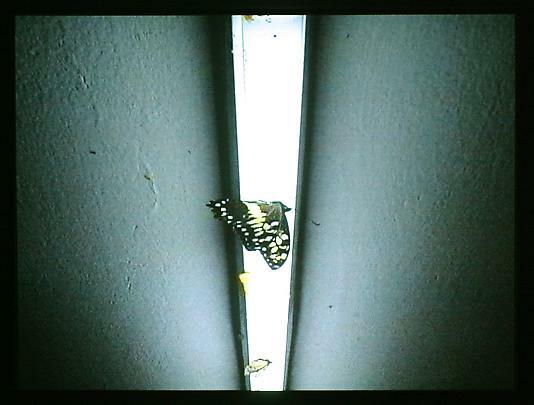 Sala's 4 Butterflies will be included in Il Tempo Del Postino, Theater Basel, Art 40 Basel. Sala was born in Albania and lives and works in Berlin. Please join us at the opening reception for the exhibition on Wednesday, May 6th, from 6-8 pm.